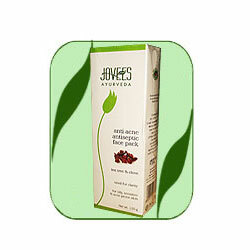 Jovees ayurvedic anti acne antiseptic face pack deep cleanses the skin and its therapeutic properties help clear acne & pimples by reducing the size of the pores to prevent excessive oil formation without rupturing the skin. Clean face preferably with Jovees Tea Tree Face Wash pat dry with soft towel. Apply a thin layer of this ayurvedic formulation all over face and neck. Leave on for 20 minutes. Wash thoroughly with plain tap water. Use once a week. Tea Tree (Melaleuca alternifolia) oil 0.5%, Long pepper (Piper longum) oil 0.5%, Nutmeg (Myristica fragrans) oil 0.5%, Turmeric (Curcuma longa) oil 0.3%, Neem (Melia azadirachta) extract 0.5%, Clove (Myrtus caryophyllus) oil 1.0%, Kaolin (China clay) 15.0%, Yasad (Ash of zincum) 3.0%, Multani mitti (Fuller's earth) 0.4%, Purified water qs.